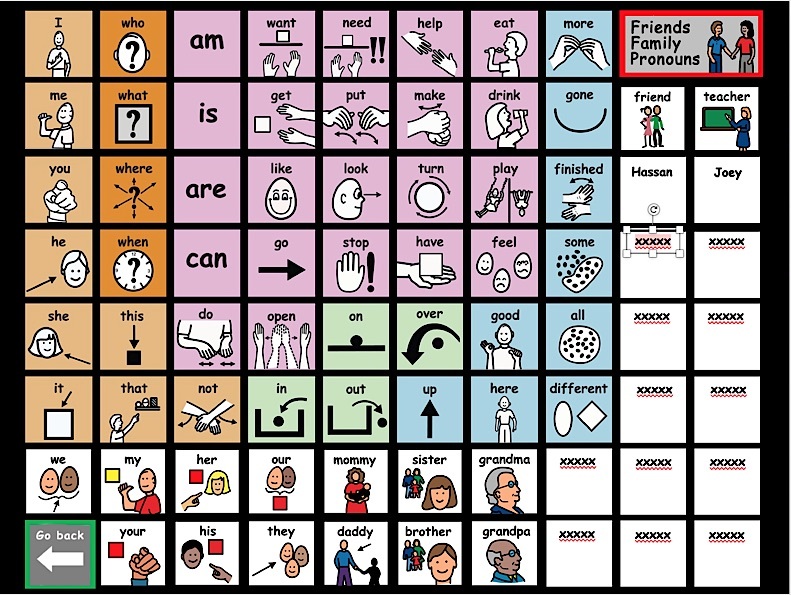 Augmentative and Alternative Communication (AAC), as the name implies, reflects a continuum of intervention options for a broad spectrum of students. Alternative: At one end of the continuum are students for whom the symbols (with or without voice-output) serve as their main voice. 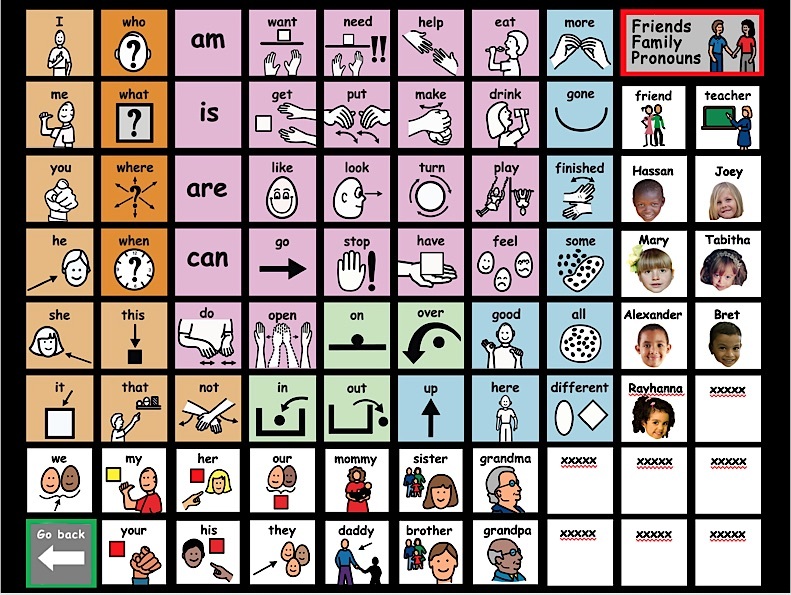 These are students for whom you MUST develop a robust communication system, one that can provide these children with a comprehensive means of communicating across a variety of contexts. Augmentative: At the other end of the continuum are children for whom the symbol support serves to augment their existing communication repertoire. 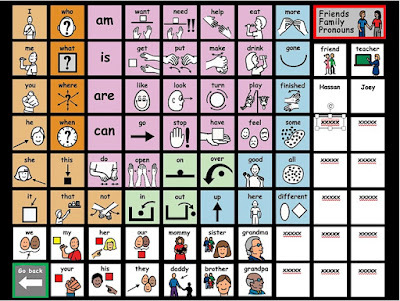 This includes students for whom spoken communication is emerging … the symbols are being used as a strategy for moving language along a developmental continuum. In essence, we are using the symbols to help make language more concrete or visible for the students we serve, with the hope of accelerating acquisition of language. (although they can be used on an interactive whiteboard). Nine Voice-Output Core-48 PowerPoint displays, appropriate for use with an iPad, android tablet or Interactive Whiteboard, are currently available through Teachers Pay Teachers. As previously noted, they are intended to serve as a vehicle for training language. On the iPad, this resource is made possible by the Microsoft PowerPoint app, a free resource that can be downloaded from the apps store. The files are stored on either your Google Drive or DropBox which is then linked to the app. For further information on linking, please review the following blog post. http://bit.ly/2xFEg5l These Voice-Output Core-48 Displays are intended to augment language training using the Melissa and Doug Play Kits. Please know they are NOT intended as a substitute for developing a more robust communication system using various more appropriate apps (e.g., Proloquo2Go, Word Power, Gateway). 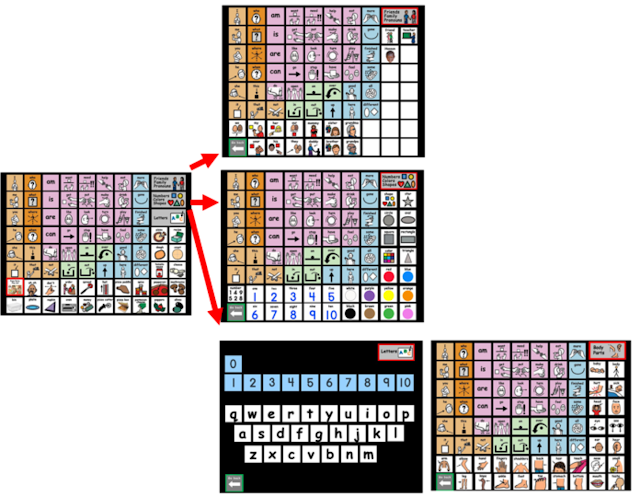 The Core-48 vocabulary remains the same across all nine play sets, while fringe vocabulary reflects the specific vocabulary needed to communicate while engaged in that activity. Each display has three and sometime four linked pages that reflect general categories … Friends/Family/Pronouns … Numbers/Colors/Shapes and Letters/Keyboard (Querty layout) … and sometimes Body Parts. These category pages are applicable to all play set displays. An arrow in the lower left corner of the category display will send the program back to the home page (page 1). Each cell on a display is a single picture/cell that produces audio when touched. 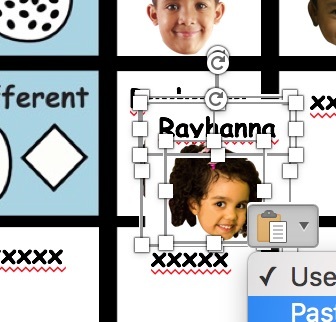 The Friends/Family/ Pronouns offers blanks where photo faces of your students can be substituted using the Change Picture feature of PowerPoint. The blank cells are currently set up with 'silence'. You will be using a sound editing program called Audacity to create audio files for these cells using a 'child's voice' , i.e., you record your own voice, then alter the pitch to create a child's voice. This 01-21-19 post provides step-by-step information on how to create voice-output 'student cells' to add to your Friends/Family/Pronouns page. 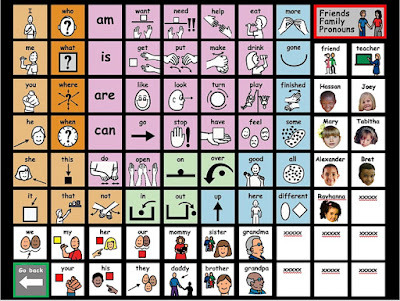 On the Friends/Family/Pronouns page, add the text for the names of your students (and your therapists, space permitting). Insert your cursor into the xxxxx text and type over the text to insert names. Do not delete the xxxxx text as this technique ensures the font and text size will match that used throughout the resource. 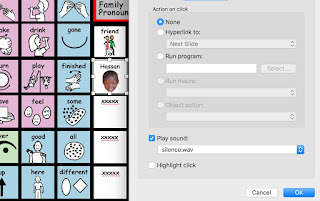 Back on the Friends/Family/Pronouns page, right click (control-click on Mac) on the cell. 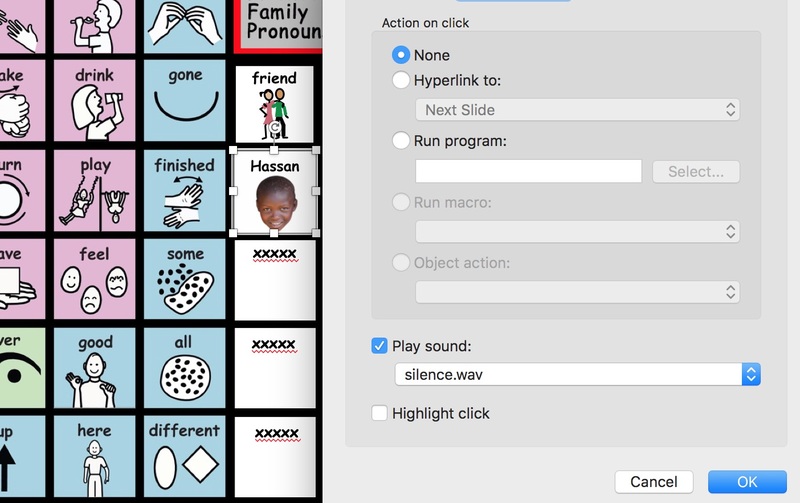 Select Action Settings… Check Play sound box … Go to the bottom of the list to select Other Sound … navigate to where you have saved your name audio files and select the file that you wish to attach to that student face cell. Repeat this process until audio has been assigned to all the photo face cells. Hope this information proves helpful. Have fun using your iPad or interactive whiteboard to conduct 'language rich' pretend play using the Melissa & Doug Play Sets. ©2019 Carol Goossens’, Ph. D.